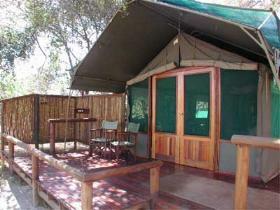 Savuti Camp is situated in the Linyanti Reserve along the Savuti Channel in northern Botswana. The camp is built about 17 kilometres down the channel from the source of the Savuti. The channel stopped flowing in 1980 and what was a Hippo-filled river is now wide open grasslands. Savuti Camp is a comfortable fourteen bedded camp providing accommodation in seven large walk-in Meru style tented rooms with en-suite facilities, raised off the ground on wooden decks. The camp has a thatched dining area, pub and plunge pool, all on raised wooden decks. There is also a curio shop and a boma area. There is a waterhole close to camp and this attracts large numbers of animals which guests can view from the camp. Activities include game drives in open 4 x 4 Land Rovers, night drives and walks with an armed guide. General game concentrations in the area a high especially in our winter months. All the predators occur in this area – Lion, Leopard, Cheetah and Wild Dog. The Chobe / Linyanti area is renowned for its dense Elephant population and for some of the best Elephant viewing especially in our winter months. 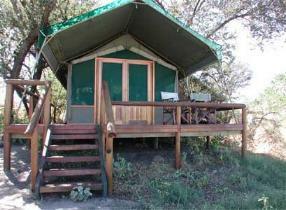 Fully inclusive tariff includes accommodation (sharing), all meals, all activities, park fees, VAT and Tourism levy.